I can’t believe I lived with that for a whole year. 😀 The “new” bathroom is so much more me. The makeover started with the new shower curtain fabric, which actually isn’t new at all. I bought that in 2016 during my failed attempt to turn my living room into a dining room. I had intended to use that fabric for the dining chairs, I believe. I can’t really remember now. But it’s been sitting in a box ever since I gave up on that vision and realized that my living rooms should be a living room. 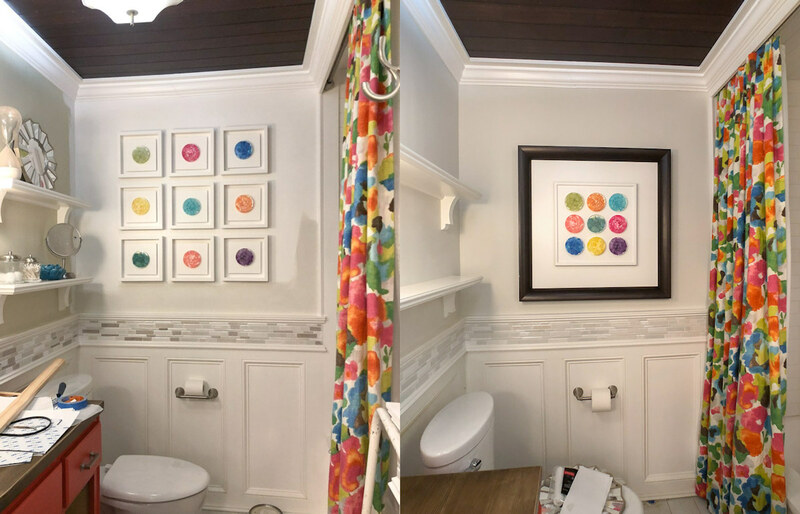 I’m so glad I came across that fabric again as I was rummaging through my fabric stash, because it made the perfect jumping off point for a pretty shower curtain in this colorful bathroom makeover. And then I pulled the coral-ish color out of the shower curtain and used it on the vanity. And I didn’t even have to repaint the doors. 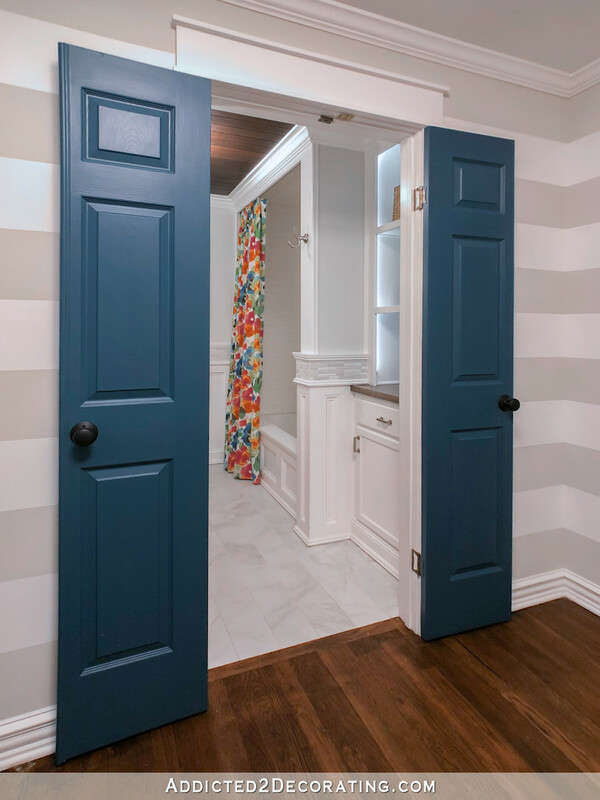 😀 That’s a good thing, since this door color that I selected during the hallway remodel is the very reason I ended up painting the vanity from teal to gray in the first place. A hallway full of teal doors with a teal vanity was too much teal even for me. The shower curtain fabric has the door color in it. 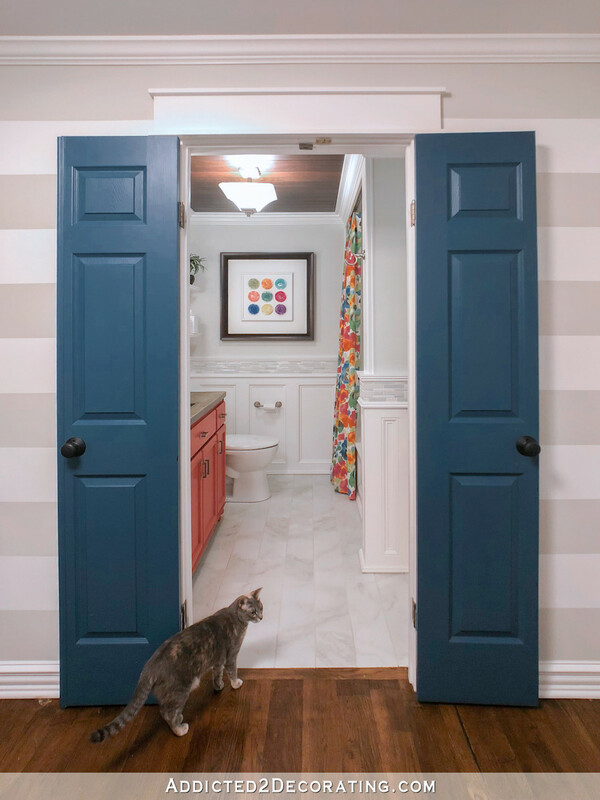 But the door color is in the shower curtain fabric, so it worked out perfectly! 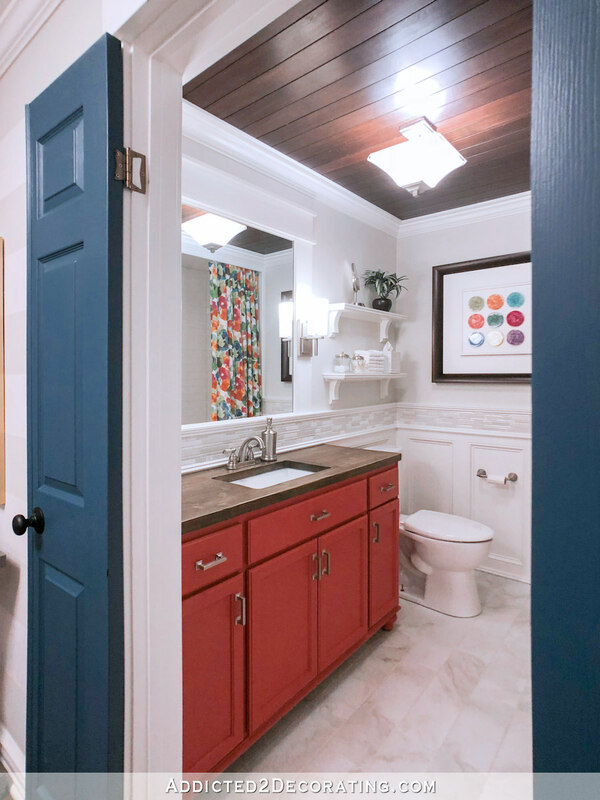 I think this new more colorful, brighter bathroom is now more fitting with the hallway and the rest of the house. Although I don’t have a whole lot of color in the hallway, I do have my coral lamp, along with some colorful artwork, all of which now tie in perfectly with the bathroom. 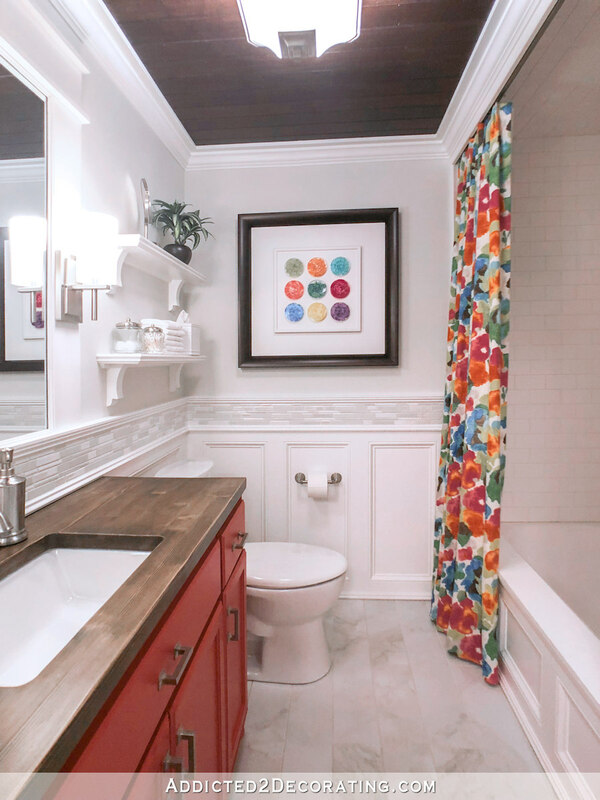 And I love that the bold watercolor floral shower curtain fabric can be seen from just about every angle. I was amazed at how much of a difference a little bit of strategically placed paint could make! Of course, I also had to do the tile at the back of the open shelves, but it went pretty quickly. After I got the bathroom finished, put all of my tools and supplies away, and cleaned up, I realized that I forgot to paint the dark tiles in the little mosaic tile strip to the right of the open shelves. 😀 Those stand out like a sore thumb, so I’ll need to do that ASAP before I get too used to seeing them and forget to paint them. See those three dark tiles? You might also notice that all three of the open shelves now have lighting. When I built these shelves four years ago, I cut little spaces at the front corners of each of the shelves so that tape lights could be fed through, but then I never got around to purchasing and installing them. So it only took me four years to finish that project. 😀 I used the same LED tape lights that I used in the pantry and on my front porch to go up one side, across the top, and down the other side with the tape lighting. The tape lights are stuck to the back side of the face frames on the open shelves. I’m so glad I took the time to give this bathroom a little makeover. It definitely suits the rest of the house much better now. And I guess it actually wasn’t such a small project. I painted all of the walls (top and wainscoting) and the vanity. I made a new shower curtain. I painted the mosaic tile. I made some new resin petri artwork. 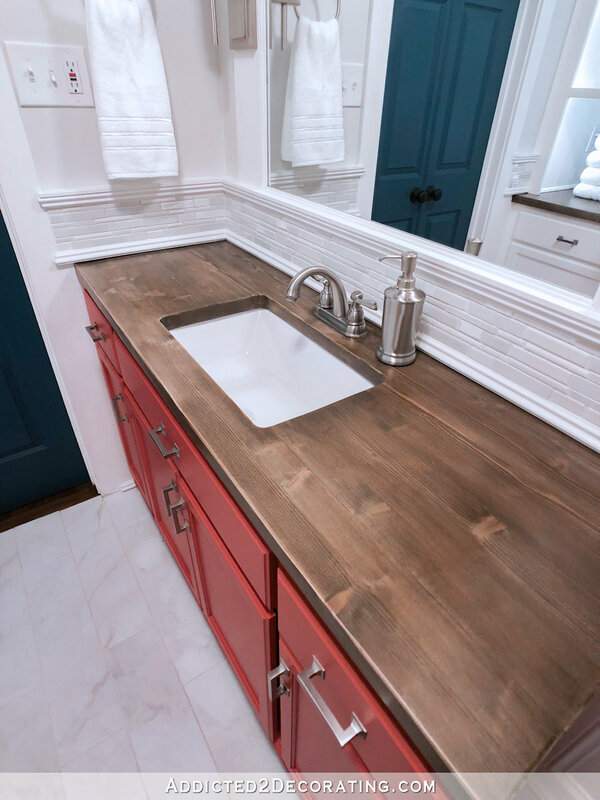 And the most time-consuming and challenging project was refinishing the wood countertops. 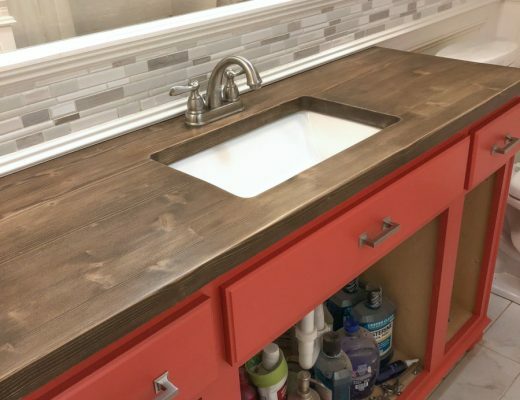 The first time I did these (when I originally made the countertops), I used so much stain to hide the yellow and orange undertones in the pine that the finish turned out almost opaque. It was so dark and heavy-looking, but I figured that since I used cheap pine, and I didn’t want to see those undertones, a thick stain finish was my only option. Well, in the years since then, I’ve learned a bit, and I discovered the awesomeness that is wood bleach. So I stripped the countertops, bleached them, and refinished them. I love the softer, more natural look, and that you can actually tell that it’s real wood. And it’s a perfect neutral brown without the yellow and orange undertones you’d usually find in pine. So it’s finished…and I’m so pleased with how it turned out. I love walking through the hallway and seeing the bold, happy colors in the bathroom. 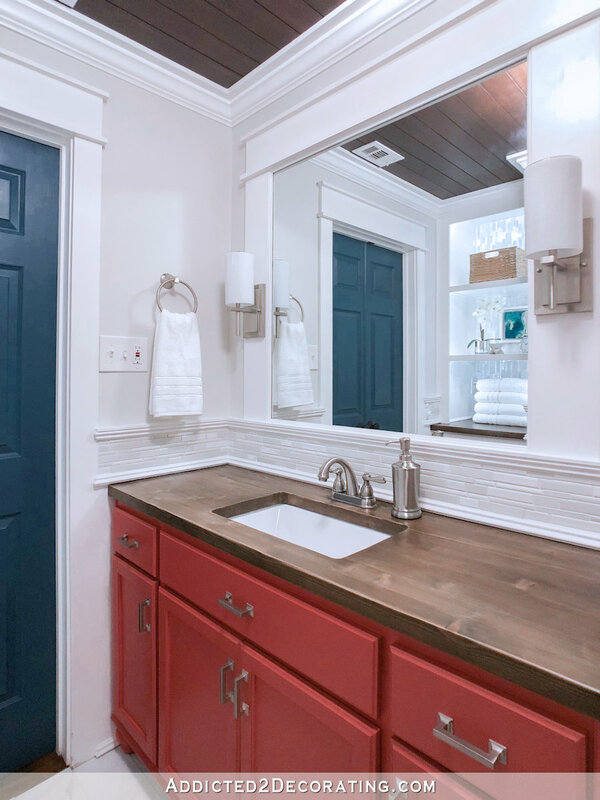 Behr Tandoori – This is the new vanity color, although it looks brighter and bolder in my bathroom than it does on the Behr website. Behr Polar Bear – This is the color I used on all of the wainscoting and trim. It’s my go-to trim color throughout my house. It looks a bit brighter and whiter in my house than it does on the Behr website, unless I use it on my ceiling. I’ve tried a couple of times to use it on a drywall ceiling, and it’s awful. Each time, it has had very noticeable red undertones when used on a ceiling. That doesn’t guarantee that you’ll have the same experience, but I just stick with pure white ceiling paint now. Interestingly, I used Behr Polar Bear on the wood plank ceiling in my music room, and it’s beautiful. There’s something about putting it on a drywall ceiling that seems to bring out red undertones. Benjamin Moore Classic Gray – This is the color I used on the upper walls. It’s a very nice and bright barely-there neutral wall color. It’s just enough color to make the white crown moulding and trim stand out. P. Kaufmann Pattern Play Tutti Frutti — This is the shower curtain fabric. I can’t remember exactly where I got mine, but if you Google the name, you’ll find several sources and can compare prices. LED Indoor/Outdoor Tape Light – These are the lights that I’ve used in my pantry, on my front porch, and now on the open shelves in the bathroom. I like that they’re dimmable with the remote control that’s included. And they’re very long, but you can cut them to any length you need. Beautiful! Love how you were able to just paint the dark tiles to make it work instead of ripping it all out. I also love how that paint color really does read as white but looks better than actual white. Love it all!!! Wow. That looks fantastic! Great job! Wonderfully colorful like you! And it looks like you crossed off another thing off your list with the door handles! I like the makeover. It is now lighter and brighter which is an asset looking in from the hallway! Way to go! Glad you are looking for shower curtain fabric source. I LOVE that thing. This is way more you. Glad you took the plung. It is all so beautiful! Thank you for being a blogger not afraid to use color. I love bright happy colors they make me smile and feel alive! I think the shelves with the towels, etc. would look pretty with the tandoori color on the interior sides. This bathroom really looks like you now. That looks so much better. I wasn’t feeling the gray either. It much more you now. I love it!!!! The bright colors are perfect! Kristi, you are much more likely to use bold colors than I am, but I love everything about the update. My only dislike is the coral vanity. 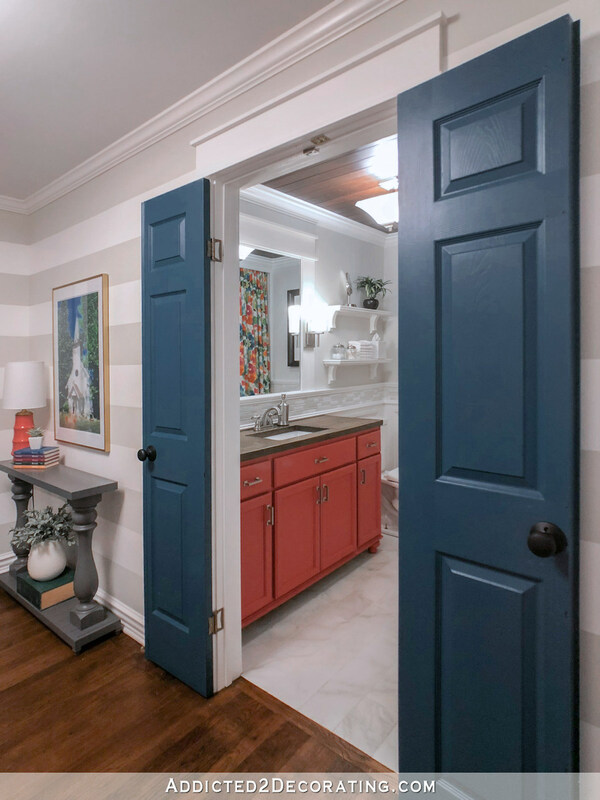 I would have gone with door color or white of other cabinet. But I know you love coral and orange so I hope you enjoy it. Lovely job! Totally disagree….I have been waiting to see that gorgeous coral color reappear in your home! It all looks so beautiful, Kristi! I love the pop of coral colour and how your lamp in the hallway ties into it too, this is sooo you! 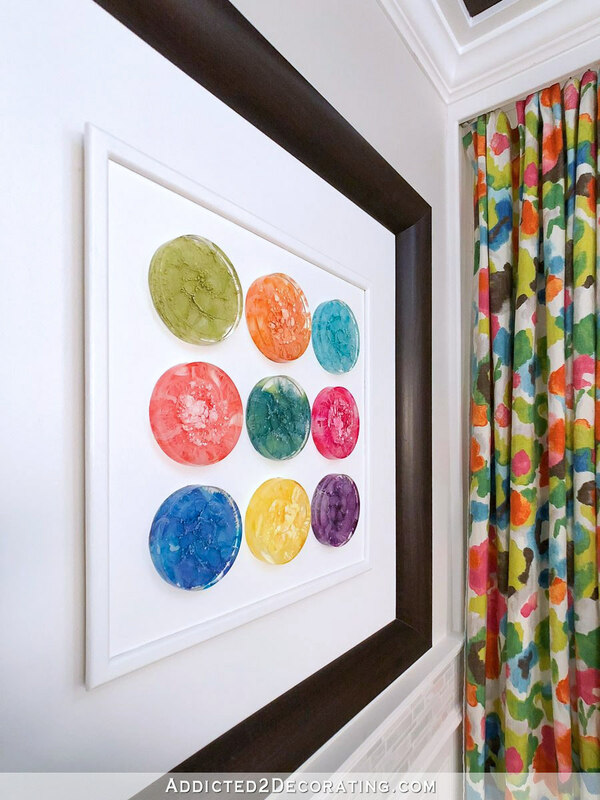 Great choice in making the petri dishes into one frame. How did you light the open shelf cabinet area and what kinds of lights did you use? I loved it before, but now Wow! It compliments the rest of the house. What I have learned from your blog is to always be happy with the end result, it should sing every time you walk on that room. And also it should sing to you and your family not potential owners down the line! Job well done! It really turned out beautiful. I didn’t think that I could like that coral vanity, but I do. The big picture with your hallway really helps tie everything together too. There’s even a little pop of coral in your geode gallery wall off to the left that ties in too. I imagine that you have a permanent smile stuck on your face, walking around through all of these colorful and beautiful rooms! Can’t wait to see what’s next! 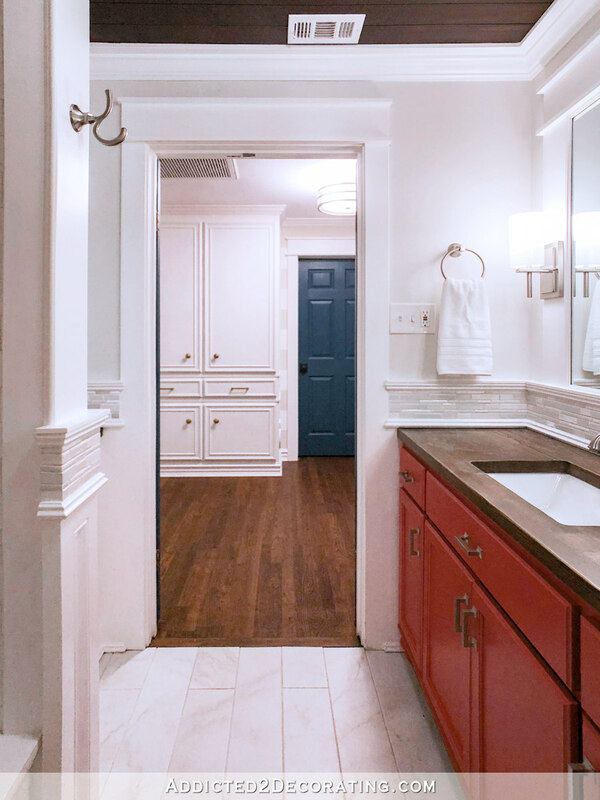 The finished bathroom is gorgeous and colorful! Just the right amount of pop! Looking forward to your next project! Absolutely jazzed to see when you will be starting on the studio! Beautiful!! Love the coral vanity!! It’s perfect!! We have a smallish section of stone on the front of our house (around garage door) they are large stones and there is an orangey color stone (maybe 20 total) that I’ve wanted to try painting. I’m going to go for it! 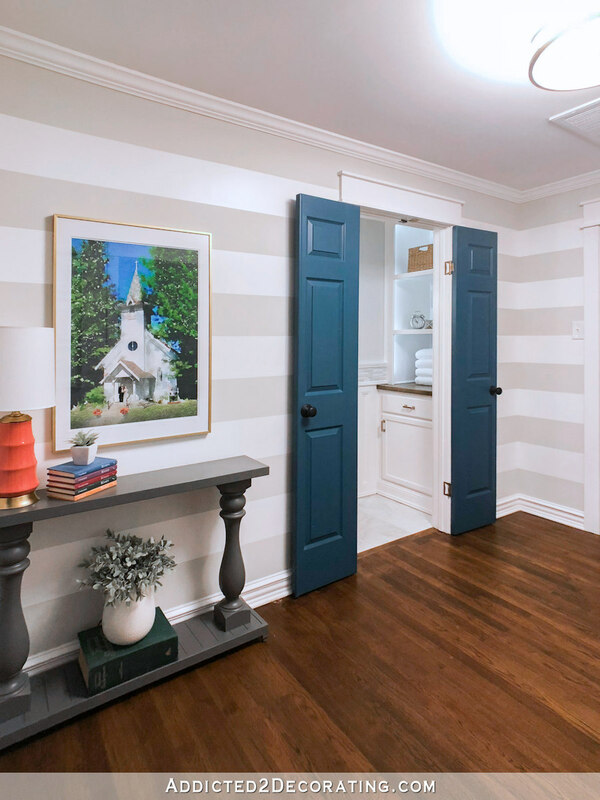 I know you’re not a huge fan of the tiles, but do you see how they relate to the hallway stripes? Nice! Yes! 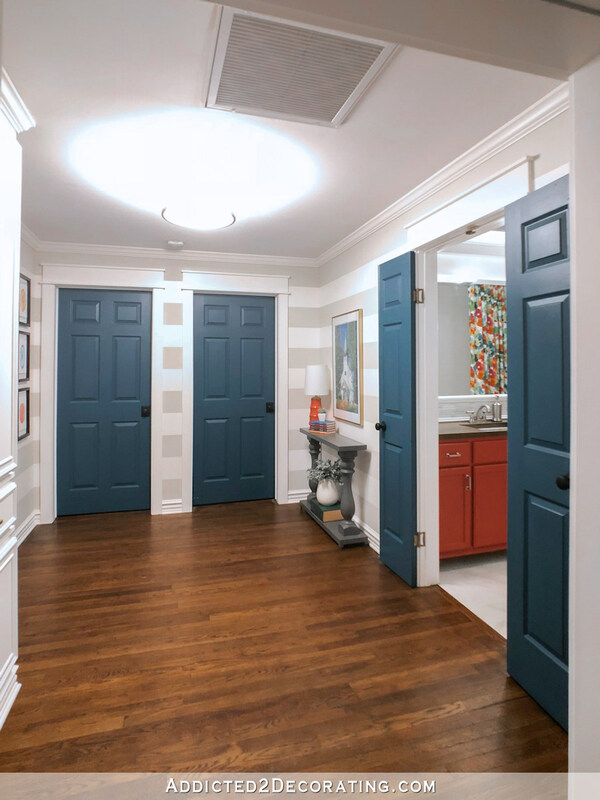 I stood back in the hallway to take pictures showing the hallway and the bathroom together, and I thought to myself, “Oh my gosh, it looks like I planned it that way from the start! They go together perfectly!” 😀 A happy accident, indeed! Yes! I totally noticed that in the photos too! And I think Kristi’s clever subconscious did it on purpose. I love this happy space! Looks like you now. Just my style also, I appreciate the color so much. Great job! The original completed bathroom was fantastic. The tweaks were awesome. This new transformation is incredible. Your house is just a happy place. I like everything you do. If I lived there I would have a permanent smile on my face :-). I am looking forward to your next adventure into your to-do list. I love it!!! Somehow when you redo rooms/areas three times or so, they turn out looking better every single time! The new pops of color are perfect. 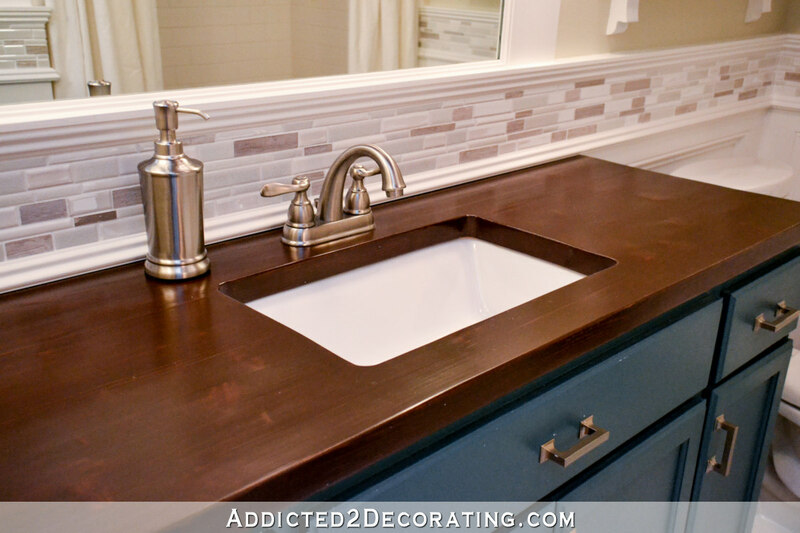 I didn’t realize how drab and dark the bathroom looked until you showed the before and after a! I just love the changes! It’s so much brighter and happier than before. The shower curtain and petri dishes look so great together. 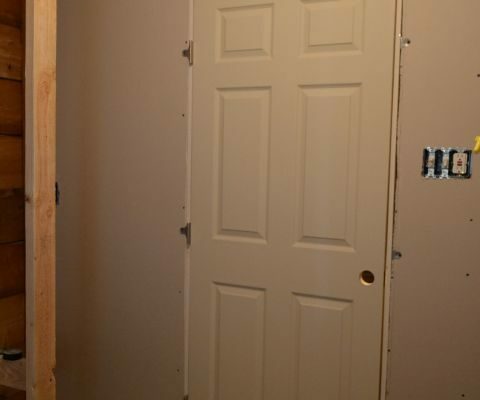 Are you planning on putting the sliding bolt lock back up? I really loved the look of that when you originally installed it. It gave the doors such a nice vibe. Gorgeous! Liked it before. Like it now. Colors are joyful. Never thought I’d hire a decorator. But I’d hire you in a heartbeat. Ready to follow you along on your next adventure in design and decorating. High five! The whole thing makes me smile. Love the posts! Love it. I have a tall cabinet next to my vanity – should I paint both the same color or just the vanity in a bright color and the cabinet in a white. If they both are in a color in would be about 7 feet of wall cabinets. At this time, they are both in the brown/pine color that comes from Lowe’s for bathrooms and kitchens. I’m with many others here. The old bathroom pics side by side really do look drab! This is amazing! I love the view from all around!! Really beautiful. Love the way it coordinates with the hall – it’s all so amazing. What a gorgeous home. I can’t believe it’s been almost four years since you did the bathroom the first time! I liked it before and would have never thought to change it, but I love the changes! That fabric is dreamy. Looks great. I dunno, I don’t mind those dark tiles.mthey look deliberate and somehow fit. You change your mind all the time and are usually happy that you did. I simply have a hard time seeing you through a ‘failure lens’. I see you’re a white towel person. Me, too. Do you go for white towels cause they’re easier to wash and don’t bleach out? Or do you just like white towels? I like them for three reasons: (1) They’re easier to care for since they can be bleached and you don’t have to worry about fading. 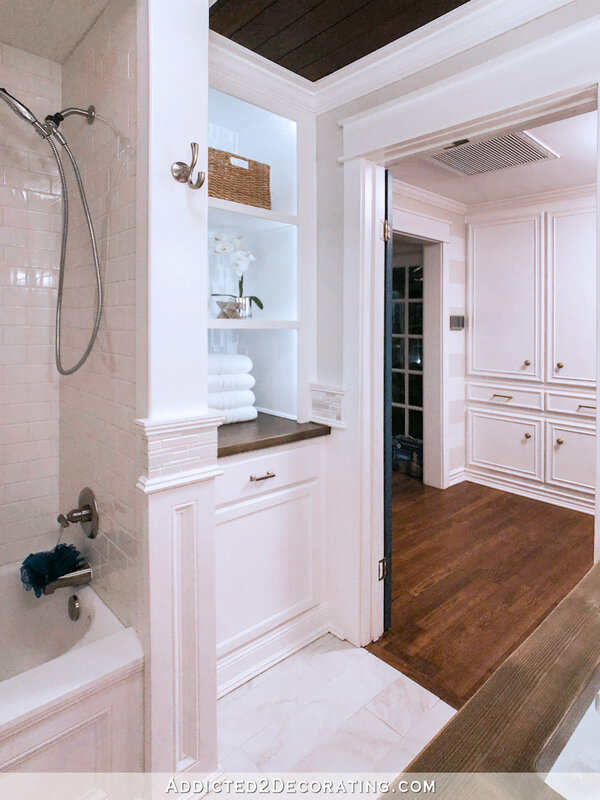 (2) To me, white lends more of a spa feeling to a bathroom. 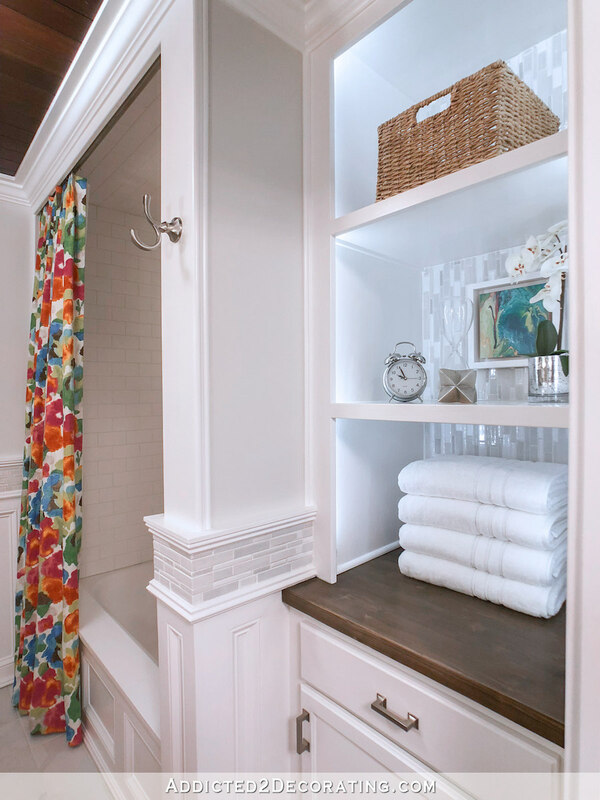 (3) I’ve never seen a towel/washcloth/hand towel so amazing that I’d want it to be a design feature in my bathroom. So I’d rather use white and let them fade into the background, and let other actual design features be front and center. Truly impressed with the change in the tile. You rock, Kristi! I really liked the “before” bathroom. But I LOVE the new version. It is BEAUTIFUL!!! Well done, Kristi! Colorful, cheerful, and COMPLETE! I like white towels, too, lol. Personally, I’d like a different art work on the wall. The piece you posted that’s says “finished bathroom art work” is so pretty and has every color that’s in the new bathroom. I’d also put a basket on the floor with something (toilet paper, magazines?) just for interest and texture. I love the ceiling and that color vanity is to die for. I’m so wanting to paint all my doors the same color as yours. It’s striking! 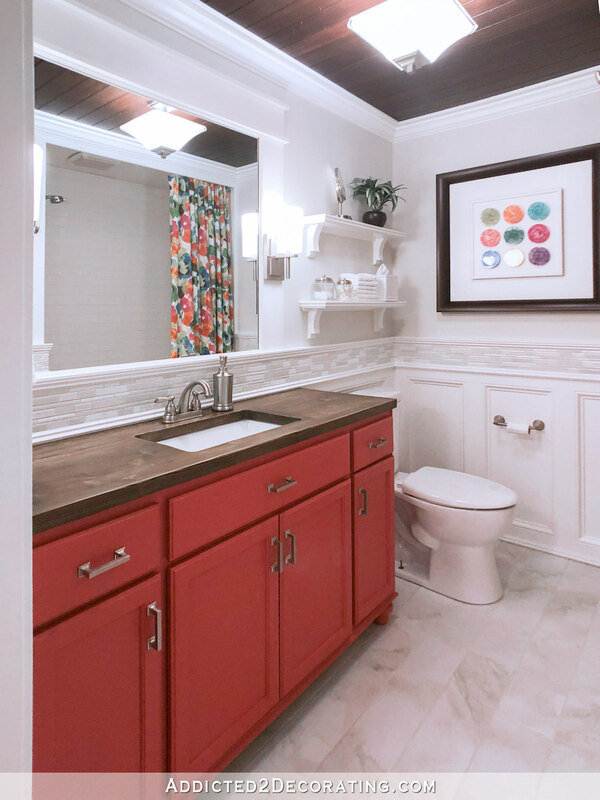 I love all the colors you used in your bathroom! So glad you are finally happy with it!!!!! Can’t wait for more things to come this year! Stunning! I love how bold you are with color choices. It’s inspiring to those of us who tend to play it safe with neutrals! I love it and enjoy receiving your updates. It inspires me to keep trying new ideas. But I do have a question. I though I read your husband was in a wheelchair. This bath seems small for a handicap person and you removed the ramp out front. Did I miss something? As far as bathrooms go, we make do with what we have for now. It’s very challenging, but we make it work. In the future (possibly this year), our current bedroom will be converted into a master bathroom, and will be completely accessible for him. The ramp in the front was torn out because it was way too steep and dead-ended into grass and rocks. It was dangerous for him, and dangerous for me to try to get him up and down that ramp. We now have a very nice concrete ramp out to the carport that has the appropriate ADA-compliant slope for him to easily and safely get up and down. I’m in love with this bathroom! Madly, deeply, truly in love! It’s so pretty, and so you! I really didn’t mind the way it looked before, but NOW – I see what you mean about it being boring. I love the coral, the curtains and the petri art, but my favorite thing is the lighted shelving. That little corner literally and figuratively lights up the space. The fact that you went the extra mile in lighting that space shows that you know your stuff! No, it didn’t need it, but it enhances the whole room, in my opinion. Lighting is everything in decor! Totally perfect! And I especially love the coral-ish vanity. Bravo on a job well done! 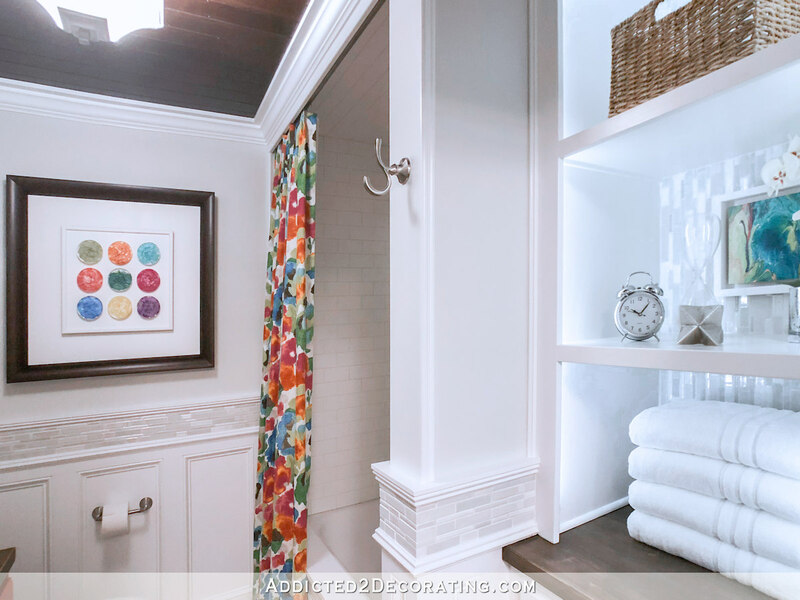 You know I liked the bathroom before but I agree that bold curtain and the whole redo is muy primo! I am fairly new subscriber to Addicted 2 Decorating. Your bathroom before pics drew me into your delicious little world a couple of weeks ago. 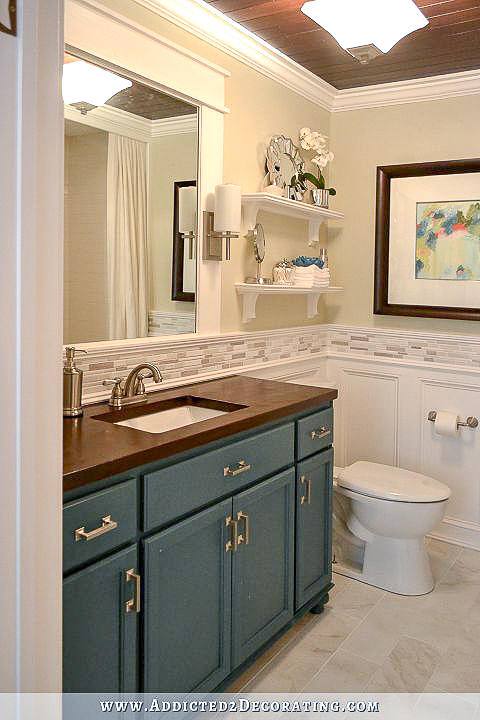 The bathroom was classy before your update and still is –now with a fun punch. I am thrilled to be in on the reveal. I am a fairly new subscriber to Addicted 2 Decorating. Your bathroom before pics drew me into your delicious little world a couple of weeks ago. 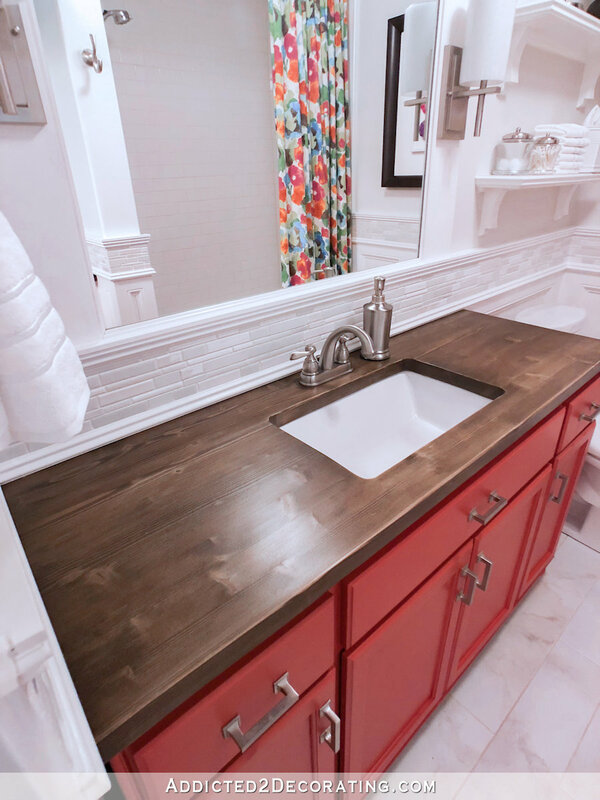 The bathroom was classy before your update and still is –now with a fun punch. I am thrilled to be in on the reveal. 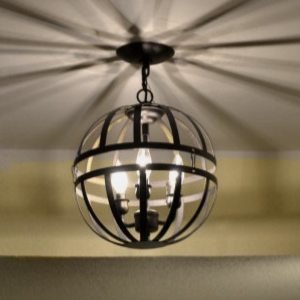 Love it, and it does absolutely ‘go’ with your hall way! You can’t fool me on a happy accident! LOL! I have questions about paint tho. My pastor and family are moving, and need much help with the DIY end of painting this run down house. My question is what is the best paint for all the wood work, to be easy cleaning, and safe for children. We have done all the walls with simi-gloss latex, but have a time finding latex enamel for wood work, and shelves. The lumber yard kept giving them Alkyd enamel, which we wanted to stay away from for the health/breathing in a closed up house[it’s cold in N TX]. Will the simi gloss work and be easy to clean? 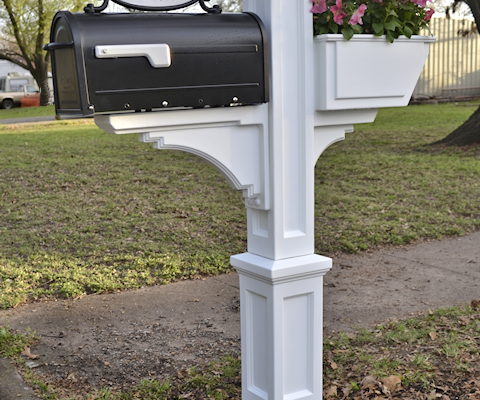 Do you have a blog where you address the paint Qualities and best uses for each? I have a very sad rental condo bathroom (but the rental price reflects it, and we have no cash for improvements) and would have been thrilled to have your “old” bathroom, but I can really see how all the new colors and patterns are “you” and I am thrilled that you are happy with it. 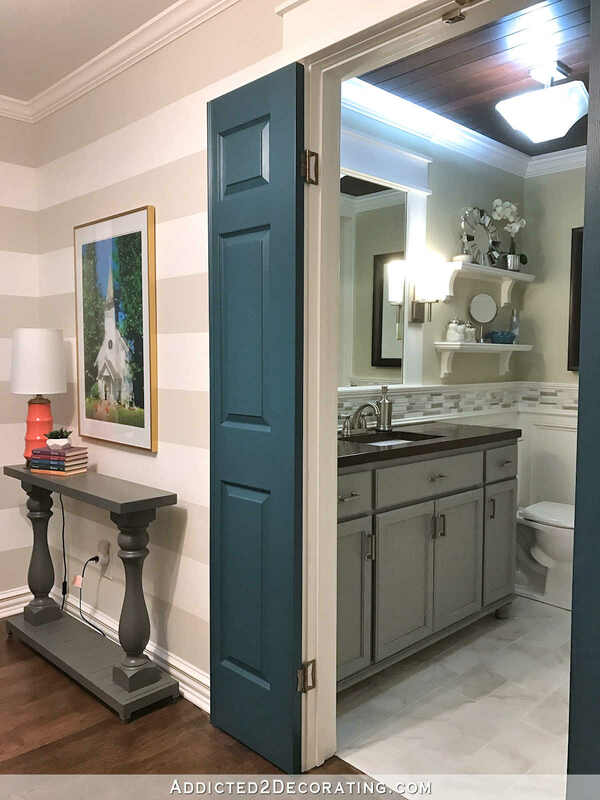 The weird thing is that I just love the two smaller doors for the bathroom. How do they lock on the reverse? May we have an inside view of the hardware? What a ding dong I am. (see my previous comment above) I am just now relating to the bathroom doors as showing what I’d see on the inside! I was wondering what a previous commenter was talking about when mentioning the hardware. I imagine you don’t lock those doors at the moment. Certainly a very brave move. I’d be the person on the inside when a surprise visitor walked through the door! That’s my luck! : ) I’ll look forward to the hardware when you find it! It’s such a happy room! I really liked your bathroom before, but this one is even better! You did it, Kristi! Now you have two rooms you can walk or peek into and just smile really big. Congrats! Wowza….WOWZAAAAAA…! 👍🏻🤩😁…….. I just love, LOVE it. A plus, Kristi. I am happy to see you rewarded with the color you love. I’m so glad you made these changes! I love how it turned out so much better!!! I love reading your blog. While your color choices are not ones I would choose for myself, your end results are always beautiful. The most valuable lesson I have learned from your blog is to not be afraid to try it and if you don’t like it – change it. When I first found your blog, I had been living with a living room I hated because I had chosen the colors and did all the work so I shouldn’t waste the money. I read your post about your kitchen cabinet color and thought I should do that in the living room. I absolutely love my living room now. Thank you for being willing to put yourself out there and for the encouragement you are to be yourself. 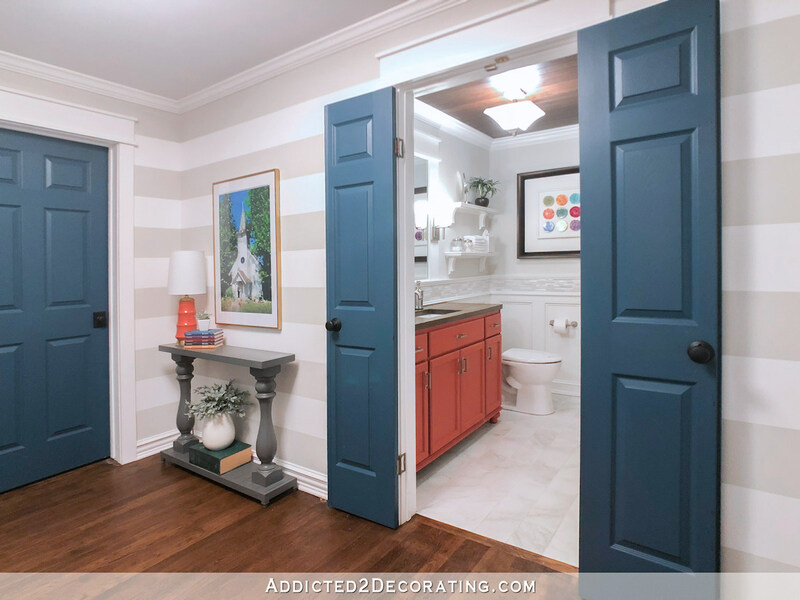 Kristi, I really liked your bathroom before, but wow, when I see the side by side photos of your bathroom, this ‘new look’ is really YOU and it ties in perfectly with your hallway. Once again, your incredible talent and vision comes to fruition and I am always in awe of what you achieve. Another amazing transformation!! What a great way to start 2019. It’s going to be another exciting year for you and Matt and us as your followers. WOW – so much more “you.” SOOOO glad you did this – it looks amazing and has happy written all over it! It makes me smile! 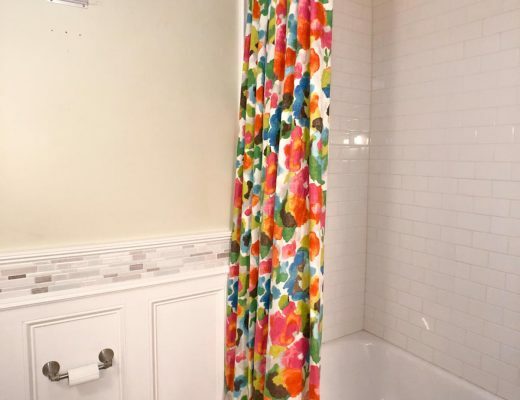 Shower curtain fabric appears to be “Play Tutti Frutti”. I’m sorry I’m so behind. This makeover is beautiful. 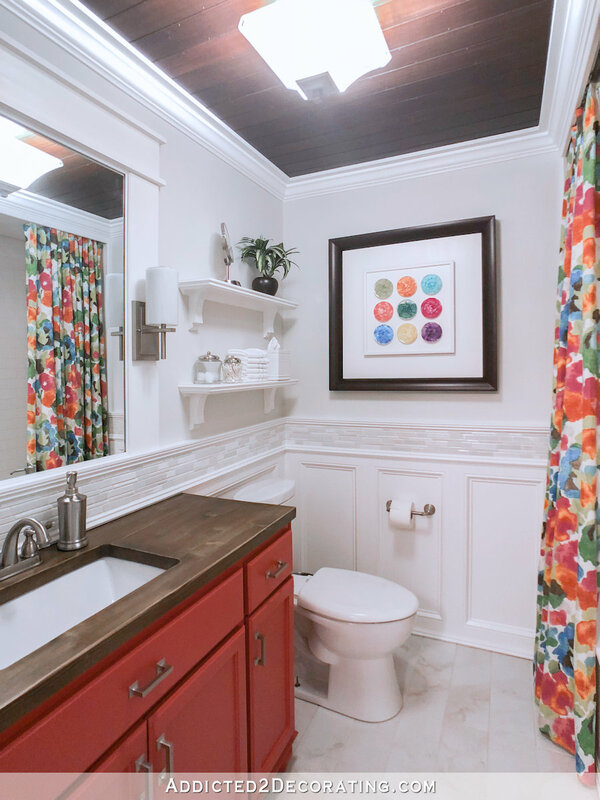 It’s bright and clean and I’m loving the colors in the shower curtain and the vanity makeover. Well done and now you can check it off your list. Gorgeous! 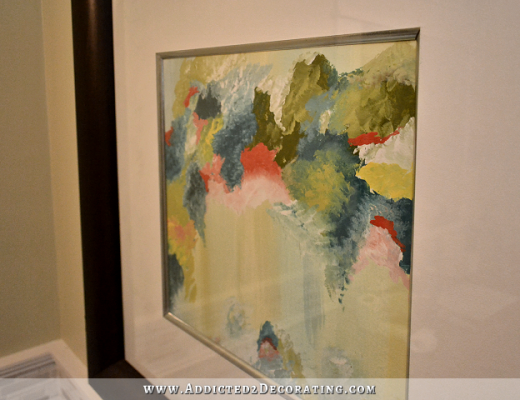 The prints in the hallway coordinate with the colors in the bathroom now. So glad you added lights to the open shelves. After I found your blog, I went to the beginning and read up to the present. I have gotten so many ideas from you. It’s great to see coral cropping up in another room! I can really see your smile whenever you pass by this bathroom. Good on you for keeping on until it makes you happy!! Love it! I’ve been in Florida for a month and just checked your blog. I loved the grey, but the change is so great and from one fabric hoarder to another, so happy with your shower curtain colors! My mom who had a very tongue in cheek humor/dry humor; said she painted a bathroom gray back in the early 60’s and every time she went into it; it was so depressing…..she couldn’t feel good about anything in her life. She repainted it; and one time out of necessity; mixed cans of paint together to paint an outhouse (seriously, it was early 1962 and we didn’t have an inside bathroom); it was a lavender outhouse!